Kaitlyn Metcalf was born in New Orleans, Louisiana, where she was raised on crawfish, po-boys, Bloody Mary’s, Jazz Fest and Mardi Gras. Kaitlyn was fortunate enough to attend the New Orleans Center for Creative Arts, followed by Maine College of Art in P ortland. After graduating with Honors, in Painting and Art History, this Southern Belle ventured even further north to settle in Downeast Maine and begin creating at Moss Keep Studio. Now, her studio is nestled in the woods, with Acadia in her door yard. She is currently best known for her Starboard Seriespaintings of boats on charts of the waters they sail, as well as paintings of Maine Men, which highlight hardworking Maine Fishermen, incorporating barnacles sewn onto circular canvases. 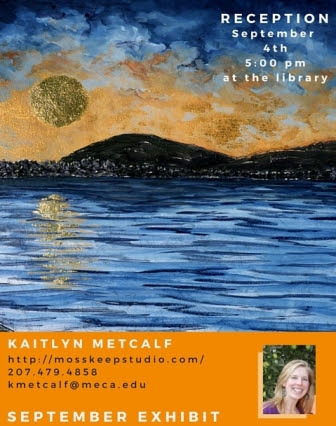 Her new mixed media work is created through a variety of techniques, including gold leaf, to depict vivid scenes from Downeast Maine.